Maggots are baby flies in the larvae stage. Flies usually lay their eggs in dumpsters, trash cans, animal feces or on old poultry or other types of decaying meat. 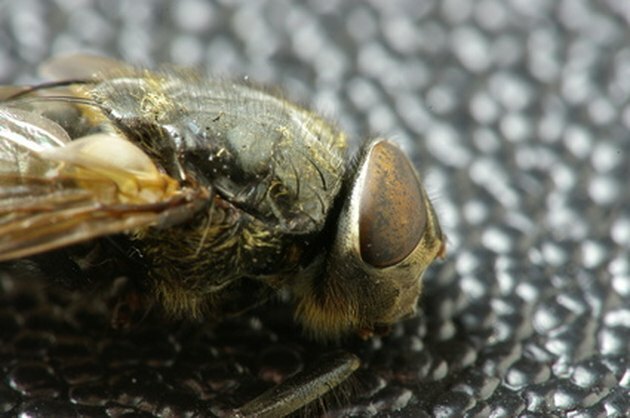 Fly eggs will hatch in less than 24 hours, resulting in a maggot. The maggot will feed and grow in the area for up to ten days. The best way to prevent maggots is to keep areas free from rotting food and feces. All animal and human wounds should be properly cleaned and dressed, as well. However, if an infestation occurs, there are a variety of ways to destroy it. Kill the maggots with a permethrin insecticide. You can purchase over-the-counter sprays or powders that contain permethrin. Spray the treatment on the maggots to kill them. Other products that may kill maggots and contain permethrin include: Formula 409, hairspray, brake cleaner, motor oil, Pledge furniture polish, some types of Raid and Draino brand drain cleaner. Check the ingredients on the bottle to be sure. Kill the maggots naturally by sprinkling salt over the maggots and then pouring boiling water on them. Clean the trash can area with boiling water to remove any maggots you may not see. Thoroughly clean all garbage cans after they are emptied. Prevent maggots from returning by keeping all trash cans sealed. Do no overfill the bins. Full trash bags should be tied securely with a wire tie or a piece of tape. Sticky fly strips or traps can be placed around trash can areas to reduce the chance of maggots. This tape attracts flies and causes them to stick to the strip. Keep your trash cans in a well-lighted area. Darker areas attract more flies. If there are fruit trees nearby, dispose of any rotten fruit that may fall to the ground. Keep the area clean. What Makes an Orange or an Apple Rot?